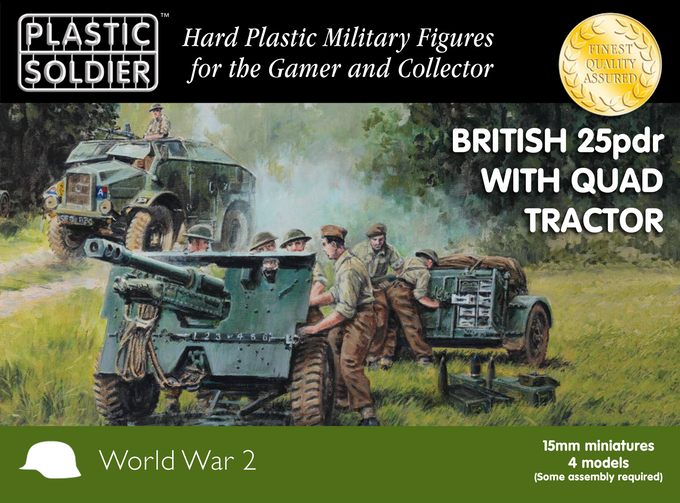 The Plastic Soldier Company have just launched a new Kickstarter project to fund a British 25 pdr with Quad Tractor kit. They are looking to produce the kit in both 15mm and 1/72 scale. The kit promises to be the biggest that they have yet produced in either scale – one of the reasons that Will has moved to Kickstarter is the fact that he would like to offer as many options on this kit as possible, but more options means more tooling – hence the project. The 15mm kit will come with 4 guns & tractors, whilst the 1/72 kit will come with 2 guns & tractors. The 1/72 kit is priced at £15, whilst the 15mm kit is priced at £19, which is a £2.50 discount on the RRP. In addition, anyone who pledges can also order any other 15mm, 1/72 or 28mm Plastic Soldier Company kit at a 20% discount (that is, any of the 85 kits that they currently have available).